If you’re traveling to Cuba, you’d better leave room in your suitcase. US visitors can now bring home Cuban cigars and rum without hassle. The Obama administration just announced new policy directives meant to increase trade and travel with the island. Now, American travelers will now be able to bring large quantities of Cuban goods like tobacco and alcohol back to the States—for personal use only. Although the biggest change in Obama’s executive action is the removal of a five-decade ban on importing Cuban rum and cigars, the policy changes have a much greater scope. The US Treasury Department is also making it easier for American companies to import pharmaceuticals from Cuba, US-based agricultural companies to sell their products to Cuba, and Cubans to purchase American-made goods online. The pharmaceutical detail is especially interesting since health care is a big area of growth in Cuba lately. The new measures won’t exactly let you start a Cuban rum-running operation, however. According to an October 14 update to Treasury’s FAQ on Cuba, Americans visitors can now bring home as many as 100 cigars and several bottles of rum from their trip to Cuba. 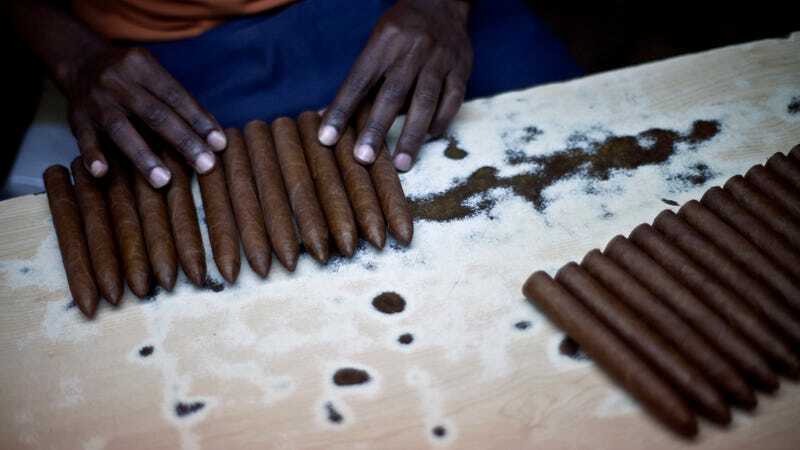 The regulatory changes make Cuban rum and cigars subject to similar duties as alcohol and tobacco in other countries, though the Feds are serious about these rules applying strictly to personal use. That means you can give Cuban goods as gifts, but you cannot sell them. This is just the latest step from the Obama administration in repealing the US-Cuban trade embargo. President Obama announced on December 17, 2014 with Cuban President Raul Castro that the two nations would begin to normalize relations after more than half a century of enmity. Then, in January of this year, the administration announced that Americans could legally travel to Cuba and return with $100 worth of Cuban cigars—a huge deal at the time. President Obama made history soon after, in March, when he became the first American leader to visit Cuba in the post-Cold War era. The process of normalizing relations between Cuba and the US will likely take many more years, but easing trade and travel restrictions is a step in the right direction. So if you’ve ever wanted to give your friends boxes of Cohibas and bottles of Havana Club for Christmas, now might be a good time to book a trip. Just don’t try to start your own Cuban cigar import business quite yet.